Although many birds were evident at Ruthven Park, particularly RCKI, WIWR, and CHSP, the weather decided to be uncooperative, hence low banding totals. A moderate wind was blowing at dawn which delayed the opening of the riverside nets. When the wind dropped and the nets were dutifully opened however, it started to rain. Of course it didn’t actually start raining until we had walked back to the banding lab…. Several RBNU were heard calling throughout the morning and the first NAWA of the season put in a (very) brief appearance before disappearing into the valley. 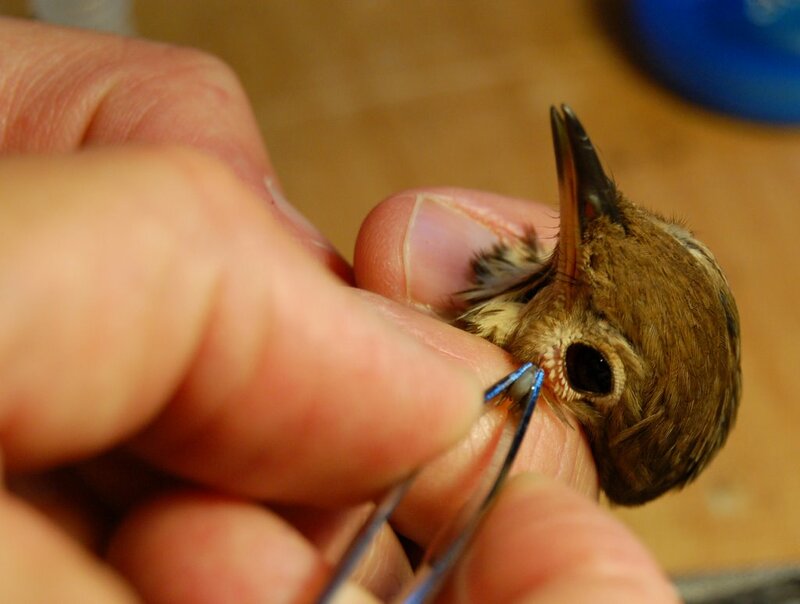 A large tick was captured in Net 6. It had a HETH attached. This low retrap total could be due to a) a migratory exodus of birds from the area, b) the poor weather conditions, c) the fact that today was Ruthven’s annual “test the security and fire alarms day” with accompanying dulcet serenade, or d) a family curse. 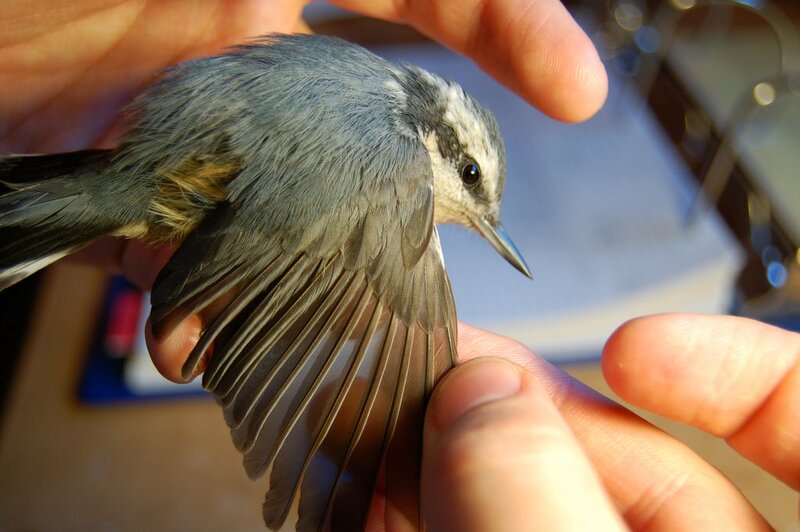 The Red-Breasted Nuthatch that was banded today. These are a bit of a rarity at Ruthven. 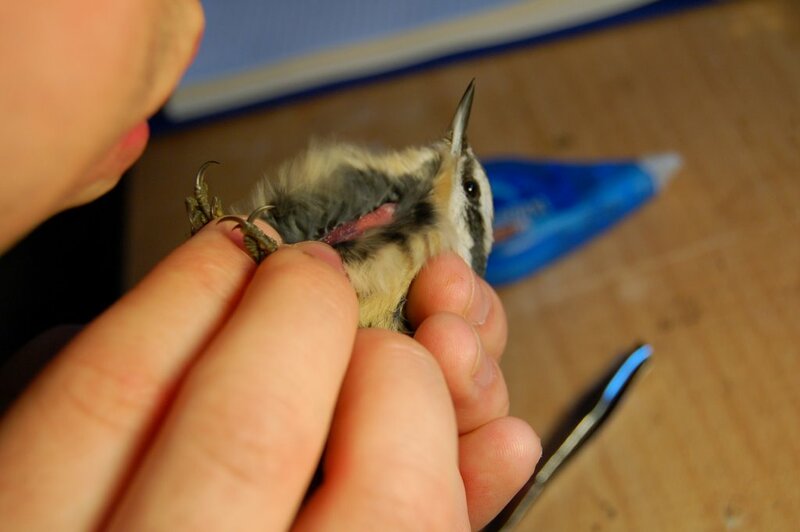 Brian removing the Hermit Thrush attached to the tick we found in net #6. Jeff banding one of the Ruby-crowned Kinglet trapped today. 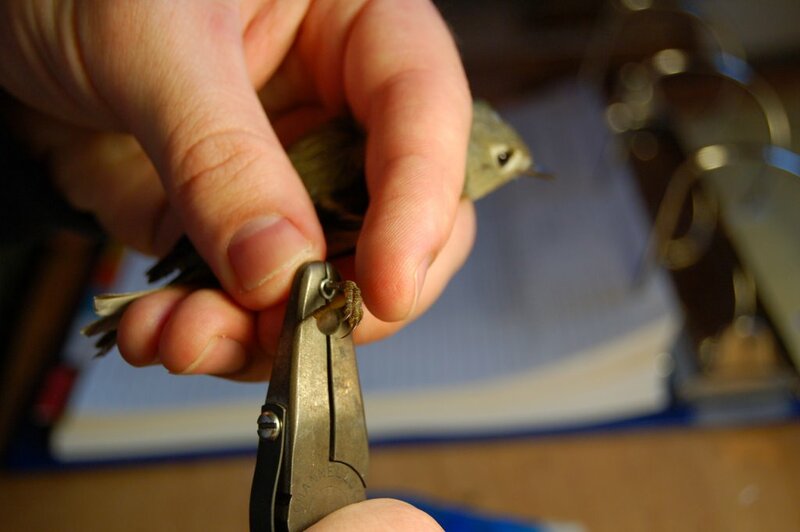 A better look at the Kinglet being banded above. 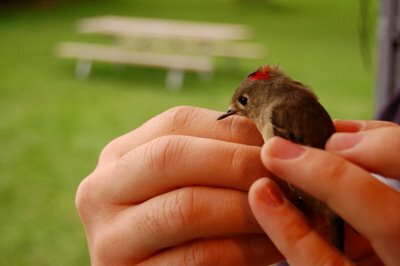 All but one of the Ruby-Crowned Kinglets trapped today were male. There are a few pairs of Eastern Bluebirds around the property now. 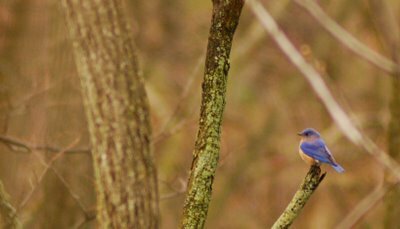 This guy was sitting in the woods near another bluebird, a Blue-Gray Gnatcatcher, and the Nashville Warbler Brian spotted. 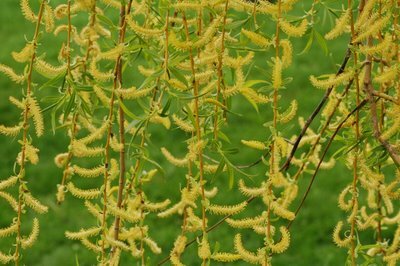 The willow near the banding station is now quite colorful. Another decent day at Selkirk. The best bird netted today at Selkirk I released unbanded, namely a female RTHU. This is the first April RTHU I have had in Selkirk and from what I can remember may be my first ever April Ontario Sighting. Since I am now in my 51st spring of serious birding I considered this significant.